There have been a few important updates on the prevention and control of MDR-GNR from ECCMID, here in Madrid. I thought I’d share a couple of key reflections. I did a talk on ‘Before an outbreak – what to do after first MDR Gram-negatives enter your hospital?’. (You can download the slides here, and see the recording here.) With some trepidation, I made use of ECCMID’s live voting system. It is by far the best live voting system I’ve ever used (combined with the best conference app by the way), and it worked a treat, with more than 100 responses to most questions! I thought I’d share the results of the votes that I ran during the talk. The first question was about screening strategies. Since I was tasked with covering ‘MDR-GNR’, I thought it would be interesting to ask the question about admission screening approach for CPE and MDR A. baumannii separately (Figure 1). Most people chose a mixture of universal screening for high risk specialties combined with risk factor based screening of all other admissions. This is the approach that is taken in my hospital group in London, and is probably a good fit for most prevalence levels. 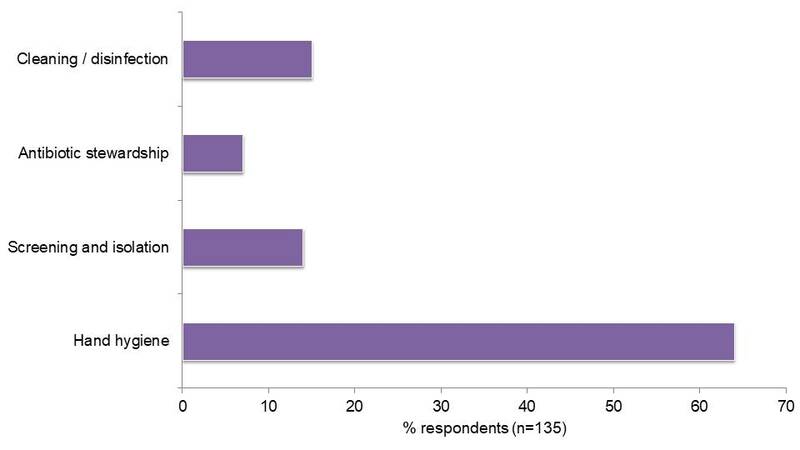 I was surprised to see approaching 20% of respondents selecting universal admission screening for CPE (although there’s some evidence that this is going to be cost-effective in most settings). 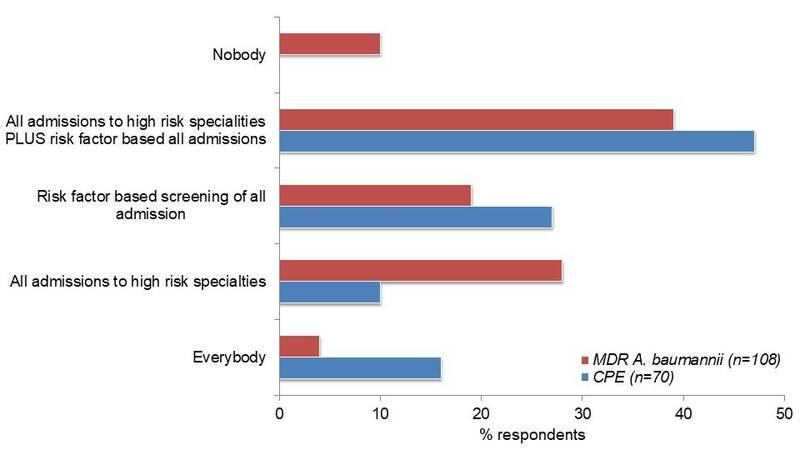 Figure 1: Who should be screened for CPE or MDR A. baumannii at the time of hospital admission? The next question was about cleaning and disinfection strategies. Again, I asked separately for CPE and MDR A. baumannii, and focussed on cleaning / disinfection at the time of patient discharge (Figure 2). There was a fairly even split between a chlorine-containing disinfectant or HPV for CPE, whereas a chlorine-containing disinfectant was favoured for MDR A. baumannii. 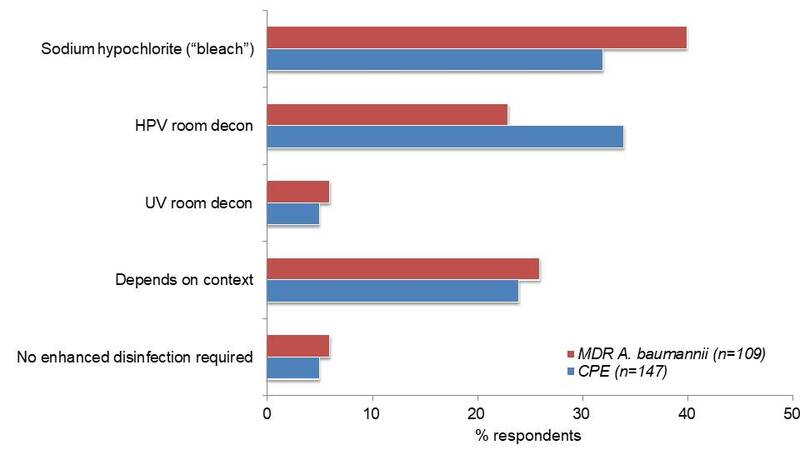 Hardly anybody voted for UV room decon, and I was reassured to see that <5% of respondents voted for ‘no enhanced disinfection required’ (notwithstanding current English guidelines to this effect…!). Figure 2: What should be used for terminal disinfection following a case of CPE or MDR A. baumannii? Finally, I asked the audience what the single most important intervention is to prevent the spread of MDR-GNR (Figure 3). About two thirds selected hand hygiene. Whilst I don’t have good evidence to challenge this, my gut (!) instinct is that cleaning and disinfection may be even more important than hand hygiene in preventing the spread of MDR-GNR. What we need is a really strong modelling / intervention study to tease this out! Figure 3: What is the single most important intervention to reduce the spread of MDR-GNR in hospitals? Advice on dealing with the media from Leonard Mermel (be on the front foot, be prepared, stay calm, be honest, be positive). Taking a positive approach to outbreak ‘post-mortems’ from Fidelma Fitzpatrick (some useful tools here). A Israeli drain odyssey from Gili Regev-Yochay: extensive work directed towards the sink failed to remove contamination, including changing the sink traps, enhanced disinfection (with acetic acid), a copper sink drain, a self-disinfecting sink drain. Nonetheless the outbreak ceased. Was this due to reduced burden of contamination, or staff awareness about drains as a risk for CPE? Gwen Knight’s modelling study: fast and expensive (PCR) or cheap and slow (agar plates) for detecting CPE? The answer is that this depends on setting and prevalence, but agar plates with PCR for confirmation seems best balance between risk and resource. Some useful tools from ECDC for preventing the entry of CPE into your hospital. We presented some data showing that, surprisingly, individual based risk factors (e.g. overseas travel and abx exposure) more important than community-based risk factors (e.g. social and material deprivation) in predicting ESBL carriage. Sun-Hee Kwak presented some work from Korea examining CPE transmission dynamics: 2.6% of >3000 close contacts of known CPE acquired CPE; and the acquisition rate of KPC was 4% compared with 2% for NDM. It’s not clear whether this is a factor of bacteria (most KPC were in pneumoniae and NDM in Enterobacter sp. ), carbapenemase, or a combination of the two. An examination of CRE carriage at the time of hospital admission, presented as a poster by Sid Mookerjee. Risk factors include previous hospitalisation, and admitting speciality (helpful for developing screening strategies). Alessia Savoldi presented useful work showing that AMR in Gram-negatives and MRSA correlates nicely with income distribution. I guess that money makes the AMR bugs go around in Europe! Are we any closer to knowing what really works to prevent CPE (and other MDR-GNR transmission)? No really – we need prospective, well controlled intervention studies. And so we remain in ‘kitchen sink territory’: throw in multiple interventions in the hope that something will work. It would be great if others could add any other significant MDR-GNR related insights as a comment.